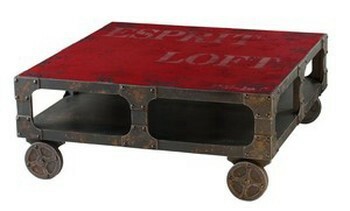 The 712 NYC Industrial Coffee Table is part of the NYC Industrial range. In the 19th and early 20th centuries, American factories produced machinery and furniture unparalleled in its craftsmanship. NYC industrial repurposes remnants from a bygone erea of pride by replicating details such as cast iron wheels, door hinges and rivets made entirely of MDF and Fir wood with pre-aged paint finishes that are both durable and easy to clean.